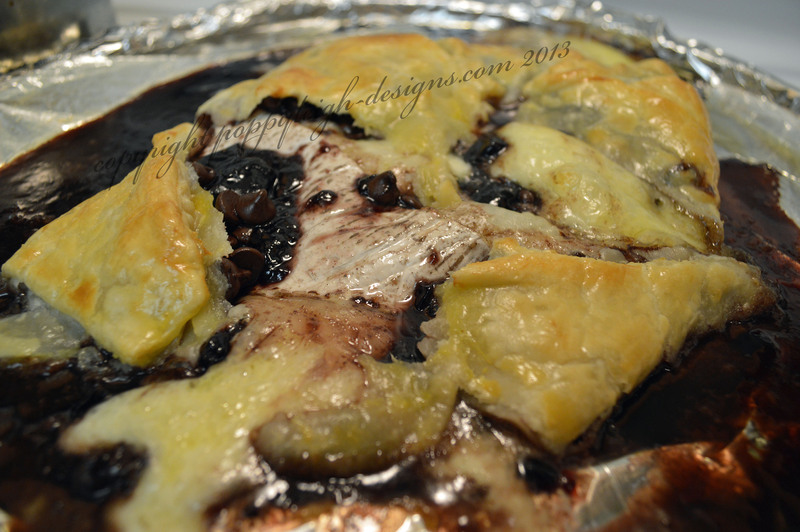 I could not believe how good this dessert / appetizer turned out, I mean it was no surprise since I mixed brie, chocolate and blackberry jam together. I’m sure that you could use any other kind of jam, but I’m a believer that blackberry and chocolate just go together. 1. Roll out the pie crust to make it just a tad thinner on a floured surface, place on a tin-foil lined or greased baking sheet. 2. If you are using two triangles of brie cheese place them skinny end to fat end on the center of the rolled out pie crust, or just place the wheel of brie on the pie crust. 3. Scoop out a good amount of blackberry jam on top of the brie cheese, sprinkle the chocolate chip pieces on and around the jam (the jam will slide off the top of the cheese). 4. Pick up the pie crust over the sides of the cheese and cover the top of the cheese. 5. Beat the egg, and brush over the pie crust. 6. Bake in a pre-heated 400 degree oven for roughly 30 minutes or until golden brown. 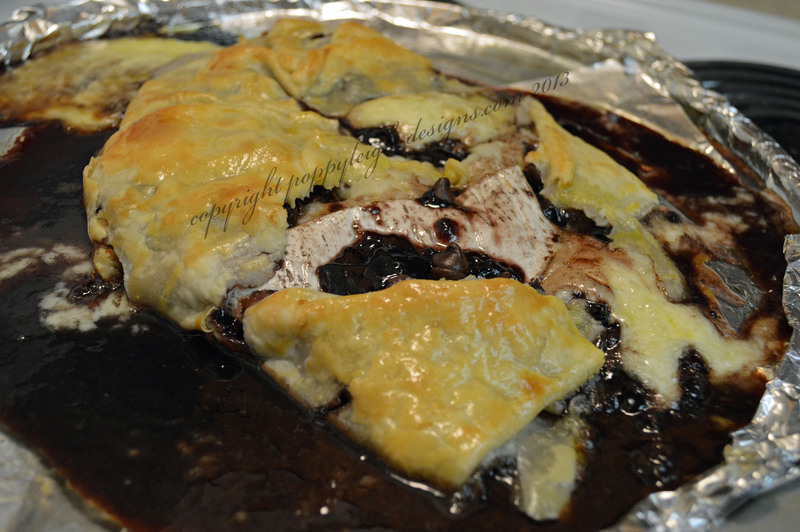 I envisioned a lovely held together brie/chocolate/blackberry pie that you cut into, but instead everything melted into one amazing mess. 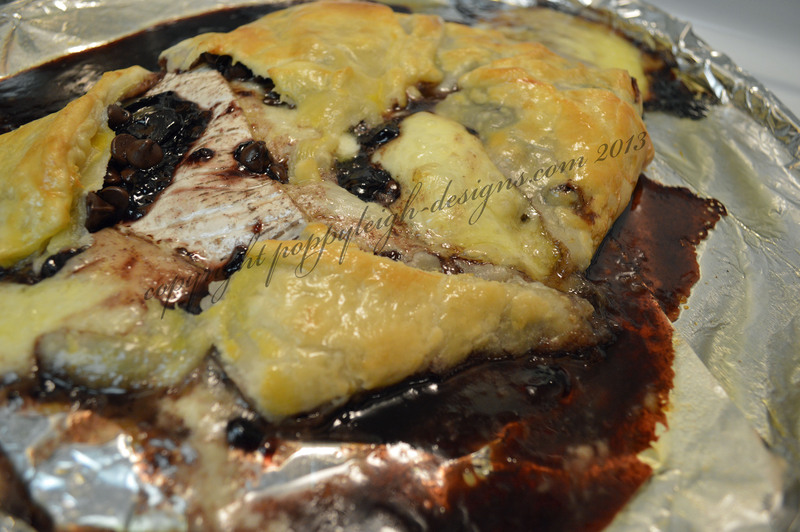 All of my friends could not get enough of this cheese, chocolate, jam delight. I was worried that two triangles of brie would be too much for 5 people but it was not at all! !